When keeping fit is the priority, you need swimwear designed for your needs. The Women's Plus Size Narciso Aqua Controlfit Swimsuit, an ideal combination of flattering coverage and durability, will help you to more comfortably enjoy every aquatic experience. 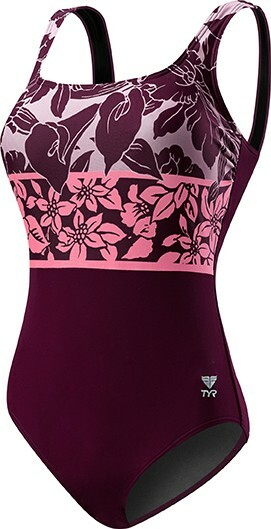 In addition to featuring UPF 50+ technology for superior sun protection, this fully lined swimsuit includes a partial pattern, classic cut leg, high neckline, thick/supportive straps and modest coverage front and back. The Women's Plus Size Narciso Aqua Controlfit Swimsuit is 100% chlorine proof, 100% colorfast, provides 300+ hours of performance and includes an antimicrobial lining for freshness. I swim in the lap pool an hour a day. Before I found TYR, my suits would get streatched out and tired within a couple months. My last TYR suit was still fresh after six months of daily use. I am six ft tall with an ample bosom and these suits hold it all together superbly. The only issue I have is that the bra lining travels and gets scrunched or folded when you take the suit off. You have to mess with it every time. Could you please fix this? i think the cut was for a shorter, wider torso... unfortunately not the best cut/fit for my shape as the shoulders dont want to stay put. Material and pattern are great. Shelf bra with foam padding is uncomfortable. The padding rolls and crinkles as you move. The fit is not good for me. If I position the bra correctly the straps become too loose and the high back catches me under the arms. Q: Hello I am a large busted 5ft 3" of average frame. 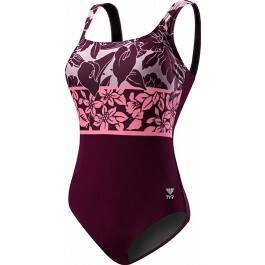 Training style swimsuits seem to be made for either bustless or firm busted women.